In the 1950's and early 60's American pop music saw the melding of different genres —rhythm and blues, country and rock and roll — bringing together black and white, northern and southern musical styles. This is the story of one of the most prolific songwriters of that era. You probably don't know her name, but Rose Marie McCoy’s songs have been recorded by Nat King Cole, Elvis Presley, Dizzy Gillespie, Ike & Tina Turner, Big Maybelle, Ruth Brown, James Brown, Sarah Vaughan, Johnny Mathis and Aretha Franklin. Born in 1922, Rose grew up in a tin shack in rural Arkansas. Her success was even more remarkable in an era when blacks and women were largely excluded from the business side of the music industry. But despite publishing over 800 songs, Rose Marie McCoy remains largely unknown. In 1952, Rose had her first hit, "Gabbin Blues". She wrote and performed it with Rhythm and Blues legend, Big Maybelle. "One Monkey Don't Stop No Show" was also written for Big Maybelle in 1953. Bette Midler covered the song in 1998. Rose originally wrote "If I Had Any Sense I’d Go Back Home" for Louis Jordan. She then wrote a different song, with the same title for Ruth Brown. Rose says the song is about leaving Arkansas to try to make it New York City. In 1954 Rose wrote "Trying to Get to You" for a little-known black vocal group called the Eagles. Elvis discovered the single in a record store in Memphis, Tennessee and covered it on his album, Elvis Presley in 1955. Rose McCoy also wrote "Very Truly Yours" (1955) for the great jazz vocalist, Little Jimmy Scott. Rose wrote half a dozen songs for Nappy Brown, including "Am I" (1955). Rose and her songwriting partner Charlie Singleton wrote "Personal Possession" (1956) for Nat King Cole. The original title was "Personal Property" but Charlie changed it to "Possession". Rose says changing just one word helped make the song a hit. Many of Rose’s hits "crossed over" from the Rhythm & Blues charts to the pop charts. "Little by Little" was recorded by Nappy Brown in 1957. Soon after it was covered by The Crew Cuts. Listen to both versions. This odd song about being chased by a giant was written for James Brown in 1958. 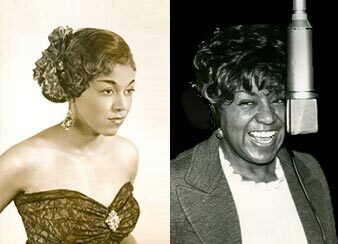 Dinah Washington was a fan of Rose’s tunes and in 1961 she recorded "I Wouldn’t Know What To Do". "I Think its Gonna Work Out Fine" was one of the first big hits for Ike and Tina Turner. It earned them a Grammy nomination. The song went on to be covered by more than five artists, including Linda Ronstadt and James Taylor in 1984. In 1977, at the age of 55 Rose decided to take another go at a singing career of her own. "I Do The Best I Can With What I Got"
Johnny Mathis recorded this Rose Marie McCoy tune, "Don’t Look Back", in the mid-1960s but it was never released. Rose recently found an old tape of the song in a box under her dining room table.